Been back from Kuching, where we spent about a month of holiday. At the first opportune moment yesterday, I went to the mid hill footpath to check on the caladiums I planted sometime in early July. To my amazement, they grew like ..well crazy. 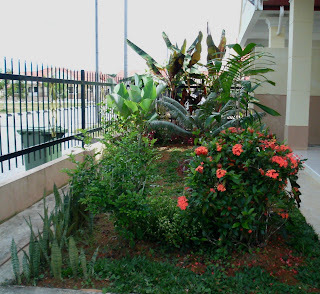 I had purposely planted these caladiums as ground cover for the heliconia strictas section of the footpath. Their excellent growth must have been due to the filtered light, rich forest soil and the regular rain experienced in Bintulu lately. 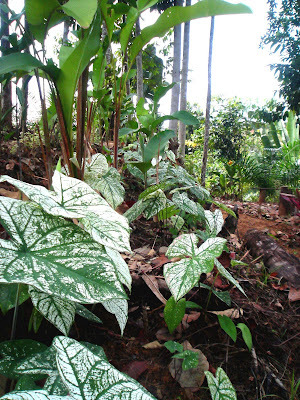 Caladium x candidum have large ovate heart leaves and may come in various colours and combinations of colours. As an example above, the green veins spread over the white wash leaves. Generally they like sunlight but not direct. You can get heads over heels about caladiums when they are at their best colours. As such there are one of my favourite foliage plants. 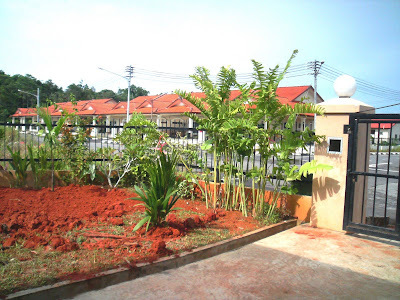 I am pleased to see some good improvements on the soft landscape of our house garden at Kuching. On this Kuching trip I am pleased to note the good results of the soft lanscaping works done on our last visit here. Below is the picture taken when we were at Kuching last June showing the ixora coccinea in orange blooms. 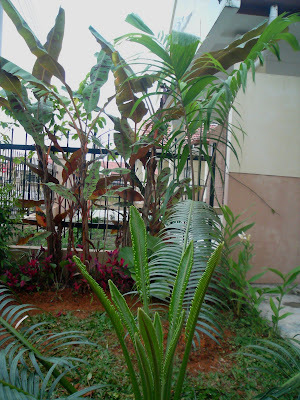 On this trip I noticed the sea cycas palm that I pruned have produced new fronds as seen below. 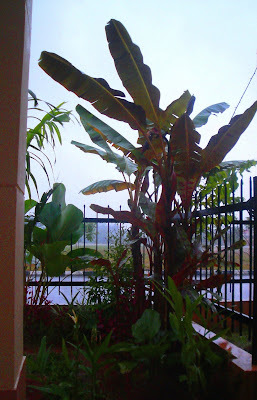 Below is a picture taken during one of those rainy days ( which are many ) on this August trip. 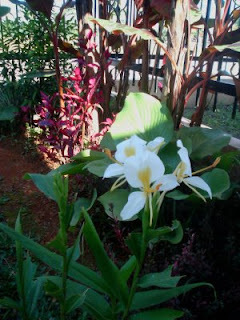 The white ginger lily has been producing good blooms recently,which I used as cut flowers. 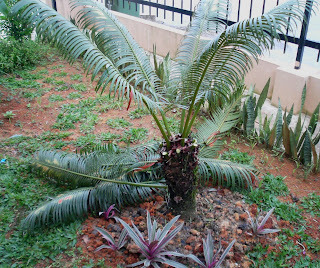 Above is a cu of the sea cycas tree that I brought from Bintulu and given a light pruning to encourage young shoots. I have started to circle the base of the tree with rhoe discolour. The pearl grass species were planted by spot turfing method and hopefully would provide total cover soon. 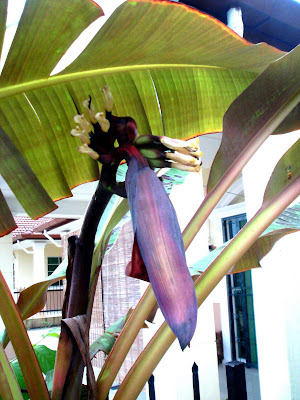 The wild banana have produced fruits and would be saved for its seeds for propagation purposes. Thus , overall the the results have been fruitful even though we have been away for slightly more than a month . On this trip I managed to order good friable topsoil of the tarat series. Here I topdressed the side garden with new topsoil prior to turfing with pearl grass. I guess I would be able to see the grassing result when we next come to Kuching ( probably in October).